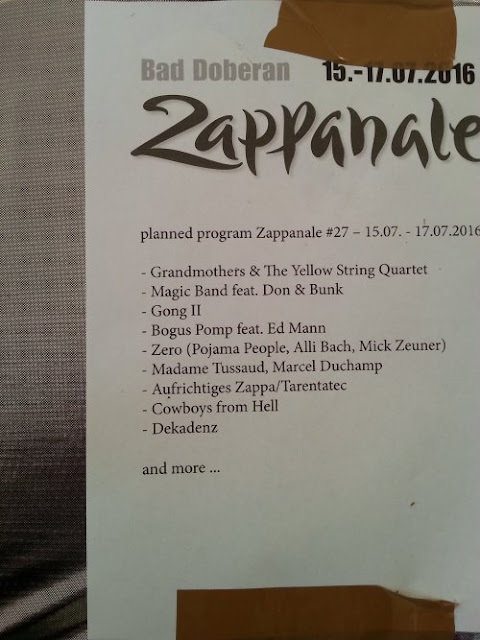 A couple of days ago, I showed you the list of bands that are already scheduled to perform at the next edition of Zappanale festival. The next edition, so that's July 2016 ! The Grandmothers (with Don Preston and Bunk Gardner) will be teaming up with Fried Dahn's Yellow String Quartet. This will be something very special. The Grandmothers and the Yellow String Quartet already shared the stage during the Grandmothers' encore at the ZappaUnion festival in Oso, november 2014. This time they will be doing a complete concert together. The Magic Band will be bringing the music of Captain Beefheart to Bad Doberan. Special guest appearances from Don Preston and Bunk Gardner are being arranged. Daevid Allen passed away only a couple of months ago. Gong will continue as Gong 2 and will be performing at Zappanale. Florida-based Bogus Pomp has performed in Zappa Town Bad Doberan in 2005, 2008 and 2012. Memorable concerts. Jerry Outlaw's heavy guitar lines fit perfectly with Frank Zappa's compositions. Z.E.R.O. or the Zappa Early Renaissance Orchestra released a very impressive album earlier this year. Another band from the U.S.A. The Zappa Early Renaissance Orchestra performs the music of Frank Zappa with a lot of respect and with a fine dose of humour. Ever heard Zappa's music performed on ukulele? Among others, Z.E.R.O. features Kevin Crosby, Rupert Kettle and Alli Bach !! And yes, you should know both Kevin and Alli from Pojama People. The combination of Madame Tussaud and Marcel Duchamp do not ring any musical bells over here. Neither does Dekadenz. Tarentatec is a great (and crazy) jazzrock band from Germany. When they perform the music of Frank Zappa, they call themselves Aufrichtiges Zappa. If I'm informed correctly, Tarentatec decided to play the music of Frank Zappa as a birthday party gift to the father of one of their band members. They had so much fun that they decided to keep on doing it. Cowboys From Hell are a top, high energy Swiss trio. They have two excellent albums out. I saw them perform at the Zapperlot festival in Switzerland last year. Superb!! And it looks as if the party already started. Here's some guy with a Z.E.R.O. t-shirt. 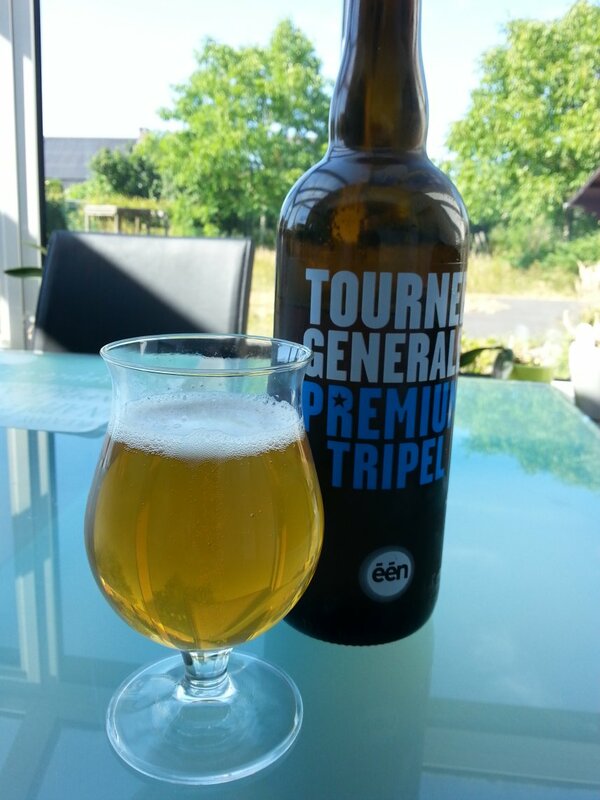 Spotted in Belgium, of all places. It seems that there is no end in sight for the series of Sun Ra reissues. "Monorails And Satellites", the 1968 album, is being reissued by the Saturn label. 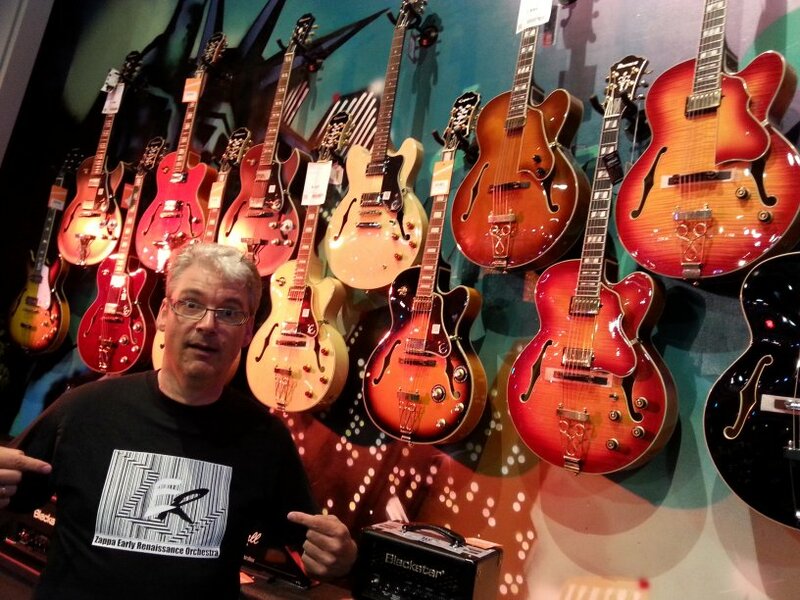 My quest for bands and artists that perform the music of Frank Zappa took me to Japan. Well, to a recent album of the Tokyo Ska Paradise Orchestra to be more exact. 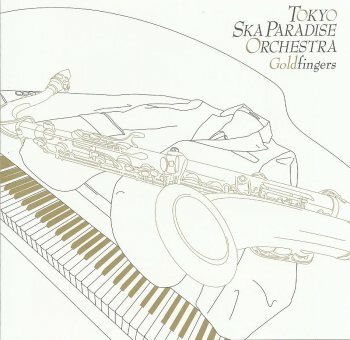 "Goldfingers" is a great jazz album. The name of the band explains it all: funky ska jazz. And somewhere in-between a superb, up-tempo ska version of Frank Zappa's 'Theme From Lumpy Gravy'. What else does one need on a Sunday morning? Just out and already very hard to find as both of these titles have only been produced in an extremely limited quantity. 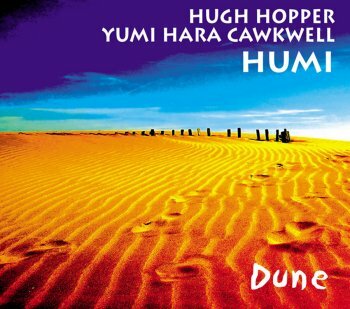 Adding facts and figures to the United Mutations Archives, I added the Hugh Hopper / Yumi Hara collaboration from 2008 : "Dune", out on MoonJune Records. 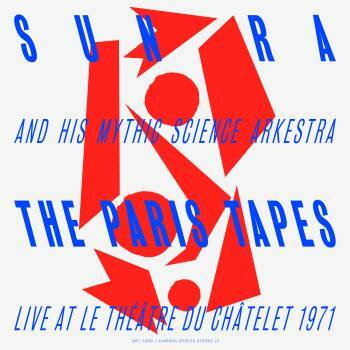 Sun Ra's "The Paris Tapes" got released as a 2CD set on Art Yard / Kindred Spirits in 2010. At the same time, the label issued an LP with three tracks from this concert. The vinyl edition quickly sold out and is now getting a reprint / reissue. 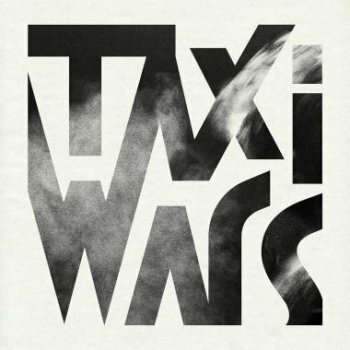 dEUS frontman Tom Barman and jazz saxophone player Robin Verheyen have just released TaxiWars, the album of the project with the same name. Compositions by Robin Verheyen, lyrics by Tom Barman. Sun Ra's 1982 album, "Strange Celestial Road" is getting a 180 g vinyl reissue. Originally released on the Rounder label (LP in 1982, CD in 1987), this re-release will be out on Celestial Records (?). A new Little Feat album has been spotten : "On The Eastern Front". Live in Japan, July 1978. The release of Little Feat s The Last Record Album in 1975 signaled another change in the group's sound. Following their adoption of a funk style, most notable on their work with The Meters and Robert Palmer the year before, but also on their previous LP, Feats Don t Fail Me Now, Paul Barrere and Bill Payne had developed an interest in jazz rock. George continued to produce the albums, but his songwriting contribution diminished as the group moved into jazz fusion, a style in which he had little interest. In August 1977, Little Feat recorded a live album from gigs at the Rainbow Theatre in London and Lisner Auditorium in Washington, DC. Waiting for Columbus is considered by many critics to be among the best live albums of all time, despite significant portions of George's vocals and slide work being over-dubbed later in the studio. It was released in 1978, by which time it had become apparent that Lowell George's interest in the band was waning, as was his health. Indeed Little Feat s first ever tour of Japan - a territory by then hungry for live performances by the band - was initially planned for March 1978, but due to Lowell s physical status, it was delayed until July. But their performance in Tokyo on 8th July finds Lowell George and the entire band on top form, as the performance there given, as included on this CD from a live transmission attests, was exceptional - a strong contender perhaps for the second best live Little Feat live album ever. Featuring a set-list to kill for - a superb selection of songs old and new - one listen to this archive recording suggests a band at their finest, not one on the skids as has sometimes been suggested - not least by Lowell George himself. Soon after the tour, George did some work on what would eventually become Down on the Farm but then declared that Little Feat had disbanded. In an interview with Bill Flanagan (for the book Written In My Soul), George made it clear that he felt the demise of Little Feat was due to his having allowed the band to be run democratically, with the result that Payne and, to a lesser extent, Barrere, had a presence as songwriters and in production which was disproportionate to their abilities. George was particularly scathing about Payne's attempts at jazz fusion. In the same interview, George stated that he planned to reunite Little Feat without Payne and Barrère. Whether or not the planned reunion would have ever gone ahead is, of course, open to conjecture alone, because sadly, while touring in support of his only solo-album Thanks, I'll Eat It Here, Lowell George collapsed in his hotel room in Arlington, Virginia at the age of 34. An autopsy determined the cause of death was a heart attack, although it is considered likely that his excess weight, drug use, and the strain of touring contributed to his condition. This concert, performed almost exactly one year before Lowell s untimely passing, is a fine tribute to a master musician and exceptional songwriter, as well as to a legendary band who - despite some unfortunate opinions which may well have been retracted had the opportunity arisen - remained, until the true ending of the classic-line-up, an exceptional and legendary group who continue, almost 40 years later, to delight and fascinate fans old and new. 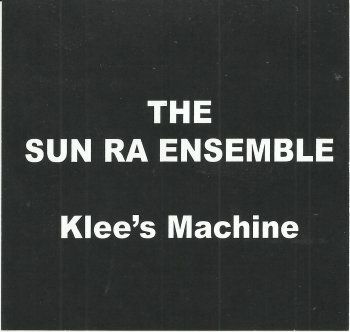 The Sun Ra Arkestra Directed by Marshall Allen is preparing for their third European Tour of 2015, which will see them landing in Poland, Germany, Switzerland, Serbia, England, Scotland, and Wales from August 8 - 21, 2015. This tour is in support of the "Babylon - Live: Deluxe" DVD and CD package release on the German In and Out label, which was filmed and recorded in Istanbul, Turkey in May 2014 during one of the Arkestra's Sun Ra Centennial European tours. The DVD portion of this release is playable only on Region 2 DVD players (Europe, Japan, South Africa, and the Middle East, including Egypt). This European Tour will total 10 performances including the Arkestra's eighth residency at the Cafe Oto in London, England August 17 - 19 and five first time visits to jazz festivals. The band will also return by popular demand to the A Trane Club in Berlin, Germany for two nights on August 9 - 10. Upon returning to the USA from the European Tour, the Arkestra will begin gearing up for the celebrations in 2016 of the Sun Ra Arkestra's 60th Anniversary with a free outdoor concert as part of the 40th Street Summer Series on the campus of the University of Pennsylvania in Philadelphia, PA on August 29, 2015. Also, the band is pleased to announce that it will be making its inaugural visitation to the Music Box Supper Club in Cleveland, OH on November 6, 2015. August 8, 2015 - Off Festival, Scena Lesna, Katowice, Poland. Show at 8:50 pm. August 9-10, 2015 - A Trane Club, Berlin, Germany. Shows at 9:00 pm. August 14, 2015 - Musiques en ete, Scene Ella Fitzgerald, Parc La Grange, Geneva, Switzerland. Free show at 8:30 pm. August 15, 2015 - Nisville International Jazz Festival, Old Nis Fortress, Nis, Serbia. August 17-19, 2015 - Cafe Oto, London, England. Shows each day at 8:00 pm. August 20, 2015 - Summerhall Arts Venue, The Dissection Room, Edinburgh, Scotland. Show at 8:30 pm. August 21, 2015 - Greenman Festival, Crickhowell, Wales. 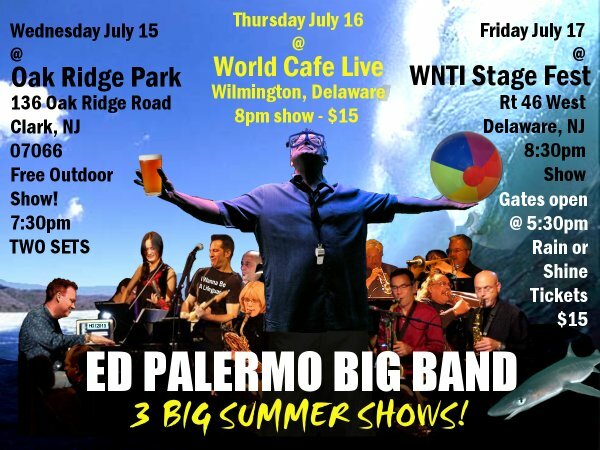 August 29, 2015 - 40th Street Summer Series, 40th & Walnut Street (behind Walnut Street Library), Philadelphia, PA. Free outdoor show starts at 6:00 pm. November 6, 2015 - Music Box Supper Club, 1148 Main Ave., Cleveland, OH. Show at 8:00 pm. Babe Ruth's "First Base" album includes the Zappa-written 'King Kong'. The album got released in 1972 in the USA on the Harvest record label and has, since then, had various reissues. On vinyl and on CD. And probably on k7 as well. The dutch Music On Vinyl record label will be re-releasing this album on 180 g vinyl somewhere in the very near future. Ray White, Bobby Martin, Tom Fowler, Albert Wing, Joel Taylor and Robbie 'Seahag' Mangano. These guys just played the best concert at Zappanale. David Bond's Sun Ra Ensemble featured Marshall Allen and Luqman Ali. They did a Sun Ra tribute concert in Washington in 2005, performing compositions of David Bond in the spirit of Sun Ra. Here's STUFF. 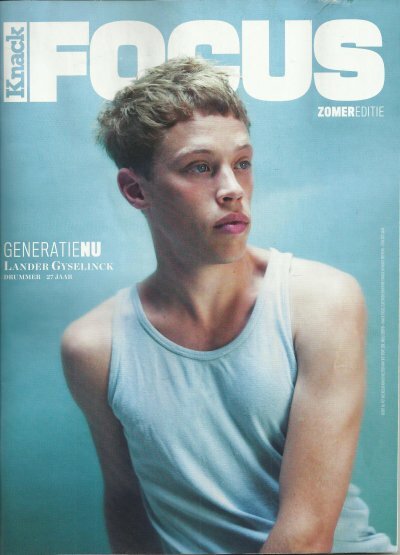 drummer Lander Gyselinck on the cover of Knack Focus magazine, July 15, 2015. The 10-page interview mentions Frank Zappa as an influence, and the Zappa tribute project that he contributes to, called Sinister Sister. 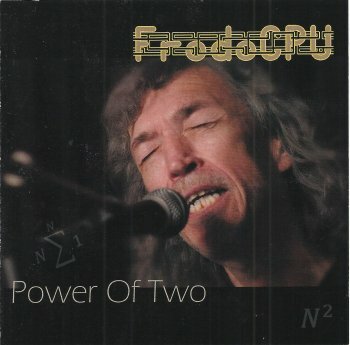 FrodoCPU is Frode Holm and Atle Bakken. The duo released "Power Of Two" in 2012. It's a fine and funky album. All original compositions, except for their very fine version of Frank Zappa's 'Dirty Love'. And no, this little YouTube video wasn't made by me. I don't have a piano. Hall Of Fame records has released a free sampler to celebrate 22 years of 'Freaktion'. This excellent collection includes four tunes that were originally written by Frank Zappa, including one that was previously unreleased, if I'm not mistaken. Zappatika featuring Ike Willis, Jeff Hollie and Craig Steward. Belgian band Aranis will be perfoming at Hafensommer Würzburg on July 27, 2015. Yes, part eighteen as I will need at least (!!) eighteen posts to tell you about this fabulous festival. For about four days a year, Bad Doberan (Germany) mutates into Zappa Town. Artists, bands and ensembles from all over the world are invited to Bad Doberan to celebrate the music of Frank Zappa. A crowd of melomaniacs celebrates it with them. Saturday night, starting at 00h30 at the mystery stage, Z3 performed with special guest (and former Zappa percussionst) Ed Mann. Z3 had been at Zappanale two years ago. They came back and did it again. My only remark is that these guys should have played a bit sooner. Or download the radio broadcast from Zappateers. 3 days of Zappa and Zappa-esque music. The biggest part of the festival will get broadcast on german Rockradio. FRIDAY - JULY 17, FROM 3 P.M.
SATURDAY - JULY 18, FROM 1 P.M.
SUNDAY - JULY 19, FROM 2 P.M.
Pomegranate Tiger, performing Frank Zappa's 'The Black Page'. 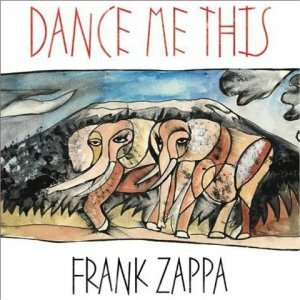 Bob Zappa's book on growing up with Frank should get published this summer. 'Energy healer' Dean Kraft on treating Frank Zappa. Album #100 in the official Frank Zappa discography. "And what I'm working on right at the moment, is a synclavier album called "Dance Me This", which is designed to be used by modern dance groups. It's probably not going to come out until next year". So it took a while, but it was worth the wait. R. Stevie Moore's fourth album, "What's The Point?!! ", was originally released on vinyl by the Cuneiform label in 1984. It has been re-issued on CD by Cuneiform. "Modern Drummer Classic Tracks" is a book / learning tool for the contemporary drummer. It contains transcriptions of thirteen tracks (some never before in print!) recorded by some of the most important contemporary drummers in rock and fusion. In these pages, you'll find the exact drum parts recorded on tracks that drummers have been inspired by since their release. Artists featured include Carter Beauford, John Bonham, Terry Bozzio, Vinnie Colaiuta, Phil Collins, Stewart Copeland, Steve Gadd, Keith Moon, Neil Peart, Simon Phillips, Jeff Porcaro, Mike Portnoy, and Steve Smith. Includes great photos and backgrounds on each of these drummer's drummers. Terry Bozzio ? Vinnie Colaiuta ? Wonder which pieces they picked. Finnish label Herakles Records has released "Mysterium Magnum" by Jimi Tenor and UMO. "...an instrumental album with the de facto Finnish national big band, UMO Jazz Orchestra. UMO is a professional 16-piece orchestra specializing in jazz and contemporary rhythm music. Throughout its history UMO has had a focus on Finnish composers and has performed hundreds of compositions that were made especially for UMO. Jimi Tenor is a Finnish composer and performing artist perhaps best known for his electronic music from the '90s. "Mysterium Magnum" is his first album composed entirely for a big band. In 2003 Jimi Tenor took his own big band on a six-week European tour, which included stops at Montreux Jazz and North Sea Jazz Festival. Jimi Tenor then made three albums with afrobeat group Kabukabu: Joystone (2007, Sähkö), 4th Dimension (2008, Sähkö), and The Mystery of Aether (2012, Kindred Spirits); and in 2009, Jimi Tenor made an album with afrobeat legend Tony Allen called Inspiration Information (Strut). Mysterium Magnum was! recorded at UMO's rehearsal space at the YLE studios in Helsinki. The music on Mysterium Magnum is not typical big band music. It varies from mystical contemporary compositions like "Koneen Sydän," "Huumatun Pako," "Mysticum Minus," and "Sähköinen Laji" to soundtrack themes like "Kratera" and "I Was Here." On the album Jimi Tenor himself plays a Russian Ritm-2 synthesizer, tenor saxophone, and flute. All compositions and arrangements by Jimi Tenor." In 1997, The Umo Jazz Orchestra did a Zappa tribute concert with special guest Ed Palermo. They released a (promotional) Zappa mini album in 2003. 2007/2008 Jimi Tenor did a series of concerts with FES (Flat Earth Society). 2LP, limited edition of 1000 copies on 180 g yellow vinyl. I don't have that many friends, but I lost a dear one earlier this week. 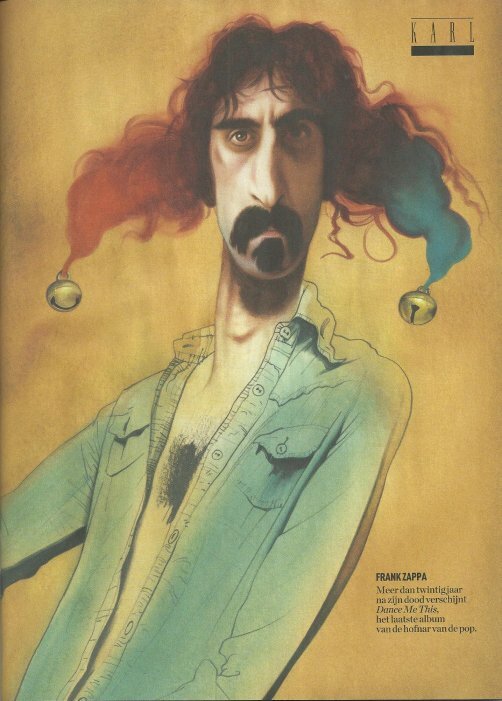 The May 27 edition of Belgian magazine Knack Focus included the a full-page illustration as a promo for the new Zappa album, "Dance Me This". 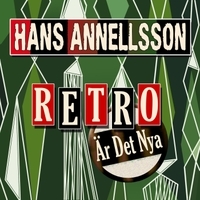 Hans Annéllsson has a new album out. Featuring Mike Keneally, Bryan Beller and Marco Minnemann. Out on July 24, 2015.
promo video for "Ley Lines", new album by Steve Lawson, Andy Edwards and Phi Yaan-Zek. 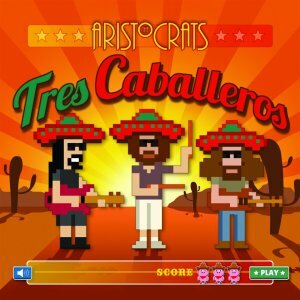 The Aristocrats are Guthrie Govan, Marco Minnemann and Bryan Beller. Their latest album is called "Tres Caballeros" and it's excellent. On the bonus DVD, they explain how the album came about. Usually, each of them writes a couple of songs and sends it to the others. Everybody learns the songs and then, afterwards, the three of them meet in the studio, record the album and start touring. This time, Guthrie, Marco and Bryan were able to play a couple of gigs at the Alvas Showroom in San Pedro, CA, a couple of days before they went into the recording studio. Meaning that they were able to get more comfortable with the songs and to try out and to adjust certain things. Playing Zappa and more ! 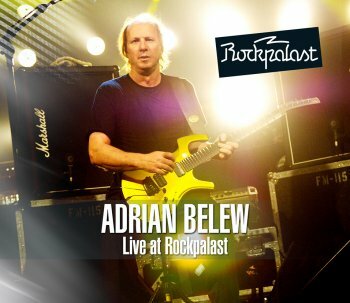 Adrian Belew's "Live At Rockpalast" finally arrived. Released by the U.K. based Repertoire Records label, this CD / DVD set brings the Adrian Belew Trio on the screen of your choice. Adrian Belew, Julie Slick and Eric Slick. Recorded at the 2008 Leverkusener Jazztage. Playing a set of material by Adrian Belew and by King Crimson. In the interview snippets that appear between some of the tracks, Adrian talks about meeting Julie and Eric, and also about his time with Zappa. Steve Vai inspired madness by Patrick Souza, performing Guns n' Roses' 'Sweet Child O' Mine'. The last couple of years, Yumi Hara has suprised me a number of times. There was the excellent "Upstream" album with Geoff Leigh, the impressive soundscapes on "Dream Of The Gryllidae" with Tony Lowe, and the more psychedelic "Mitsugi - Esoteric Rituals" release by Mammal Machine, to name just three. One of the more recent projects that Yumi Hara took part in is called "The Artaud Beats. It also features Geoff Leigh, Chris Cutler and John Greaves. Check your Henry Cow albums if these names don't ring a bell. The four of them met at the Avantgarde Festival in Germany in 2009, resulting in an inpromptu Henry Cow tribute concert. Adopting the name The Artaud Beats, the quartet did another gig at the Nodutgang Festivalen in 2011, followed by two tours in Japan. The Artaud Beats released a box set and some CDR's with material from their Japanese tours, but now there's "Logos", the band's first studio release. Available from ReR Recommended Records (Europe), Wayside (USA) and DiskUnion (Japan).